Sometimes I wonder if I being in the Philippines will be the death of my parents. In fact, could you be giving your loved ones more grief than necessary? I often get messages from Texas asking if I am okay, are there floods where you are, did the typhoon hit you, how far away is that volcano from you or have you had any problems with terrorists around there? Things like that. Mostly I tell them that things are okay and there is no flooding, that volcano is hundreds of miles from here or I haven’t seen a kidnapping or even a terrorist (that I know of). It got me to thinking though about when I was in the United States. I didn’t know about the layout of the Philippines either. I was hoping to come up with a solution to resolve their fears. I don’t really know what to do except be sure they know the region of the Philippines where I live and maybe send them weather updates when bad weather is coming. Of course send them reassurance each time something bad is happening on the island somewhere. Those travel adversaries that the government issues are not very helpful to calm them. You see, here in Calbayog City, we do not get natural disasters (knock on wood). At least we haven’t thus far. We are away from the open ocean, so no direct hits from a typhoon or a tsunami. Although we do get some mighty strong wind and hard pelting rain occasionally. We do not have a volcano in the area, so we won’t die a horrible death by melting. I have not felt anything but a small earthquake since I’ve been here, and that was only once in almost 2 1/2 years. We also do not even have any mountain in the area, so that means no landslide. It seems that a lot of people in the United States and probably in other parts of the world, do not realize that all the flooding that goes on in the Manila area, is not all over the country. Oh I know that other parts of the Philippines also have a tendency to flood, but Manila and other parts of Luzon usually gets the bulk of the rain and floods. I think it’s because of them trashing the streets and blocking the drains, but that’s another story. Although my Dad does not do Twitter or Facebook and he does not have Google or Skype on his computer, he does have Yahoo and Yahoo Messenger. We usually talk several times per week, because he is amazed at the quality of the calls. He says it’s better than some of the local calls he makes there in Texas. In between the calls though, if he hears of something bad happening anywhere in the Philippines, he contacts me again, usually at my Mom’s request. Each time they contact me I have to once again inform them that Manila is many miles from here, like the distance from Austin Texas to Baton Rouge Louisiana, or something like that. At least they can understand that example, because that is something they know about. The actually distance from here to Manila is approximately 686K and from Austin to Baton Rouge is approximately 694K, at least according to the place I looked it up, so I’m not far off when I tell them that. I guess it’s just in the nature of the ones that love you to worry. I suppose that no matter where you are or what you do to reassure them, they will still worry. I guess I’m pretty lucky to have them. I hope there is someone that loves and worries about you because that is what makes them YOUR LOVED ONES. I guess the Philippines really pissed the U.S.A. off when they booted them out in the nineties and US decided to tighten up their policies about allowing Filipinos to come to US. They only have the politicians which they keep voting in office. If I am not mistaking back in sixties if Filipina was married to American and marriage was on file with Embassy and marriage was proved not to be sham to get green card, it was auto granted after interview by embassy staff. After my wife paid fixer to get her paper work and other stuff together, I had to take her to embassy just once for interview. I think the wait was longer than the interview. I do not think it cost that much back in sixties when exchange rate was 4 to 1 and I was only making 279.00 a month in Navy. My wife carried a green card for almost twenty years in states before she decided to get citizenship when she wanted to get a job after kids where in high school. So I say blame it on the knuckle heads in both governments who do not want to work for a living for problems of getting wives to states without all the hoops they have to jump through. They do make it difficult George. I guess they are trying to stop all their citizens that actually have enough money to make the trip, from deserting to the US. Of course they all would not do that, but a lot of them would. I’m glad that I never had to deal with the things like this. I met my wife already in Texas. It’s in this story in case you missed it. That’s still around $1200 a person. I’ve been back and forth nine times in the last three years (Cleveland to Calbayog) and can’t afford to go back again this year without winning the lottery, lol. First time I went in 2009 I paid around $850 and there was more baggage allowance. The other thing that kills me is the missed connections and resultant extra costs. I’ve been fighting for two years now with PAL over a missed flight due to thunderstorms in Houston that cost me an extra $2200 for two people. There’s at least one missed connection every trip. That ferry to Santo Nino running only once a day didn’t help either. Now we have the house in Bgy. Capoocan at least we don’t have to deal with that. The asawa is much happier in the city, too. Is there any word on the airport improvements that are supposed to take place? I saw something posted on Facebook but it was mostly in Tagalog so I had to rely on Google Translate to try and decipher it. Seems they were complaining about the fact that money had been set aside for improvements but nothing had been done yet. It would be nice to be able to catch a more convenient direct flight again. The sky high prices of airline tickets are the main reason why I really don’t mind the Space A flights, even with the delays and the hassles. In the long run, it turns out a lot cheaper for us and we usually get to see a few different places. Plus you get to meet people mostly in the same mindset as you. I never had a missed connection or had to worry about a ferry boat, so I can’t relate to that. I’ll try to find out some information on the airport, but I didn’t see the article you are talking about. If I see it, I’ll try to get someone here to translate it more fully. They probably spent the money on other things or deposited it in their personal bank accounts. I know that Calbayog will never be the tourist attraction that they ‘say’ they want it to be unless they get that airport up to 21st century standards. I hope they take care of that soon. It was too difficult to copy it like you did though. I thought that maybe you would like to save this link on your computer, maybe not. And just one more. I know that you probably won’t be going on this trip, but it’s nice to dream sometimes. Besides, you never know. So 1219.44 x 2 = 2438.88 – They are out there, probably some less expensive too. Depends on when you travel and sometimes at what time. This one has a long layover in Hong Kong. Rick. Also my wife’s co-worker just went to PI and she paid just under $900 round trip Seattle to Manila. Last Dec we paid $1100 rt Seattle to Manila, I found could get best price going right to the airline web site. China Airlines and Evergreen Air had the best deals. I knew there were prices lower than that $3600 that Rick quoted before. First time I came to the PI commercial the ticket prices were barely over $700 rt. Now I think that $1100 is the standard, with the occasional upper $800 and lower $900 during non-peak times. I never heard of Evergreen Air. I’m going to look them up and add them to my Travel Icon. I guess, from checking, that Evergreen is Eva Airways, at least for passengers. Evergreen seems to be for cargo only. Yea john you are right,dont know why i said evergreen was thinking eva. Rick. First if you go for tourist visa she will not have to do the medical or any of that stuff. When my wife got hers I just told them I had been living in the PI for 5 years and every summer I would go to Alaska to fish for 3 months, then return. We had no business, but my then girlfriend had a bank account. I think what helped a lot. At her interview I was with her and when her name was called I went up with her. I did 90 percent of the talking. I talked about Alaska and how she would meet my family, just like you talking to old friend. I would think if you are in PI for 2 years and on a permanent visa that would show the PI is your home and you will return. Doing the immigrant visa isn’t illegal if you chose to return to the PI. It would take longer to get a visa. I helped a friend from Subic do the same thing and it took him 8 months. Before he did that he tried to get a tourist visa. He didn’t go with her and she was turned down. See Rick those are pretty good things to know, if you didn’t know them already. Even if you did, but not sure, it’s helps. I’m glad I never had to worry about anything like this. On the negative side though, if I did, I’d know more about it and could help more people. Of course then I might not have so many helpful people like Rick and Wayne leaving comments on my site. John there is nothing wrong doing that with going with immigrant visa as long as you leave the USA, if you choose not to finish paper work once you get there. There is a time line like the fiance visa. There is no penalty for changing your mind. Also I was going to pass on to Rick that I talked to a friend tonight who is on SSD and there is no problem with his wife working, he said he is the only one that can’t work. Well Rick I sure wish I was rich so I could let you borrow the money, or if I was rich enough, just give it to you. It would be a worthwhile thing to do. I think you can get the round trip tickets for less than that though. Still the passport and visa thing would have to get done. UJ thanks for the thoughts but we will get it worked out. 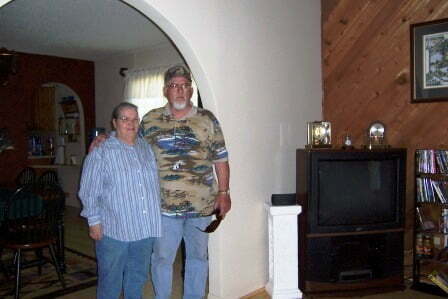 Just found out today mom and dad are going to sell their house and move into an assisted living location. They are having problems living alone so its better for them. I told them to spend my inheritance its ok, just be happy. I’m the only child and I joke to them about me only inheriting everything. But I did get upset they are getting a one bedroom place. I said where do Flor and I sleep. On the floor was the reply LOL. Oh well we are just plugging away to get the papers we need. I’m having my parents send me a report from their main doctor on their medical status, hopefully that will be helpful in getting Flor a tourist only visa the first time. Well if we do get rich soon, I may still get you the money. I hope that the paperwork works out. It can be tricky and lengthy in the PI you know. Rick about five years ago I got my wife a visitor visa to spend three months in the USA. I did this before we were married. I did it all on the internet, very easy, made appointment and everything. The most important thing is to convince them you both are going to return, in other words, the PI is your home. I tried the medical route they were not interested in that. I had been in the Subic area for five years when I did it. Another way to go which is easier, is an immigrant visa, but then you return instead of doing the paper for that visa. I helped a friend get a fiance visa and only took three months to get it. They came back before the three months were up. Hope this info might help. Well Wayne I think that should at least be of interest to Rick. I know I thought it was interesting reading. You might notice that it is now in a different type of font, at least it is on my end. I was trying to find a way to mark it so it’d be easier for me to find it again. If Rick decides to do this, he would still have to come up with the money for the plane trip and living expenses while there. It’s something to put in the old memory bank though. You’re right about not lying Rick. Sooner or later it could come back to bite you and your wallet. I hope Wayne has a good answer for you. My Dad is still around, lost my Mom almost six years ago after a battle with cancer. I keep in touch with Dad, who has a “girlfriend” now and lives in Vegas. I call him about once a week via magicJack. It’s hard for me to use the phrase “girlfriend” for my soon-to-be 80-year-old father. Dad used to think the same thing as your parents whenever he heard about any calamity in the Philippines. Finally, after over three years of living in the PH with my beautiful asawa, I think he finally comprehends that most of what he might read or see on TV about the Philippines, doesn’t really impact us that much in Iloilo where we live. Besides, Dad’s too busy hanging out in the casinos playing the slots and bingo and flirting with cocktail waitresses in skimpy outfits to catch the news that much anyway. Dang Dave. I hope that if I live to be 80 and Lita passes on that I will be able to maintain a “girlfriend” too. Go Dad DeWall. My parents are not into casinos, but they sure do love to play Bingo. You ARE lucky to still have them! I’ve lost both my parents in the last 5 years, but they both lived long fulfilling lives and it was a good feeling to know that they too would always worry about me wherever I was located during and long after my Navy career. Think about a Filipino family for a second that may have a loved on in the USA….they would wake up daily wondering if their loved one was safe from tornadoes, volcanoes, hurricanes, floods, fires, mudslides, avalanches, earthquakes, roving raving maniacs with automatic weapons, and terrorists, and on, and on. When you put things in true perspective, the USA can be a rather dangerous place. Come to think of it, I just may feel safer in the RP! I guess I am lucky and I’m glad they are still around, but there is no need to worry. That being said, it’s okay if they worry though, just not so much. I worried them when we were returning here because I went too long after Korea before I contacted them. I’m going to try not to do that anymore. They didn’t seem to worry so much when I was stationed away from home while in the Air Force, but maybe they just got use to that. I was back there with them for quite a few years (17) before moving here, so maybe they thought all the moving was over.